This creative award is a tribute to over achievers. The Ladder to Success celebrates all the qualities and merits of a successful individual. The design features a solid crystal tower pointing upward and is set on a faceted crystal base. The shape suggests upward motion. The back facet of the tower is engraved with an image of a businessman climbing a ladder. The front facet projects words that inspire people to succeed. 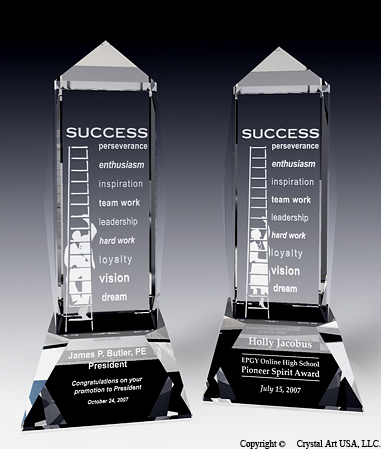 This award makes a perfect commemoration of promotions, business achievements and personal accomplishments. Personalization text and logos is engraved on the crystal base.